Better logging of actions with attached files. Imaging. New setting "Save report in the target folder"
New offline manual. 20+ new case-based articles. Scripting: Script compilation failure due to the line - Print " "
SMART reading and analysis are supported for USB drives. See the screenshot . 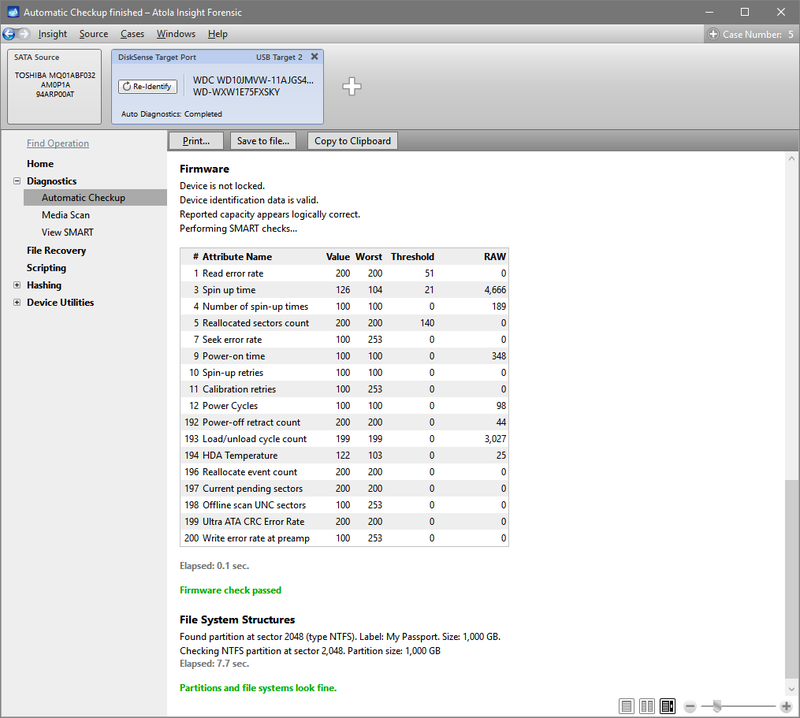 Added setting "Read SMART before and after imaging"
Preferences: Added new option "Power down SATA target device when operation finished"
Preferences: Added new option "Enable Target HEX viewer during Imaging"
Many other smaller fixes and improvements. Case Management: Notes as well as csv files can now be printed out. Bugfix: Some cases when hash value becomes invalid after Pause/Resume actions during Imaging. Automatic Checkup: Significant PCB diagnostics improvements, Insight was misdiagnosing certain drives as "bad PCB"
Starting with this release, Windows XP and Vista are no longer supported. See this blog post for details. New Imaging setting: "Limit target disk size to source size using HPA"
GPT partitions support for ext2/3/4 in File Recovery and Imaging. More than 100 small bug fixes. When imaging to file, Insight will always try to create a sparse file. This will significantly improve the speed of image file creation on a local NTFS volume, especially when performing reverse imaging. Better support for firmware access and password recovery for the latest WD drives (including Raptor models). While scanning a damaged hard drive with Media Scan in "Fast" mode, DiskSense USB might get "disconnected"
It is now possible to save current diagrams into a PNG or CSV file. Please note that we are phasing out our old file recovery engine. We will be replacing it with a much easier and more powerful system. First phase of current monitor accuracy improvement. Next version of Atola Insight will include one more fix that will make current monitor as accurate as it can get. Write Protection is now fully functional and protecting from any write attempts, including firmware area alteration attempts and other operations that might directly or indirectly write to the firmware area. Additional fields are stored into the database during firmware backup: Maxtor's ROM CRC, Maxtor's "Model", and Hitachi's microcode revision. This is useful for locating a firmware in the database. Read/Write ROM on Western Digital drives with Marvell CPU. Firmware map import feature added for Maxtor, WD and Samsung. Error reporting improved; customers can now leave comments when program crashes. Stability improvements and bug fixes for DiskSense firmware.